I'm trying to use a dual quaternion Hand Eye Calibration Algorithm Header and Implementation, and I'm getting values that are way off. I'm using a robot arm and an optical tracker, aka camera, plus a fiducial attached to the end effector. In my case the camera is not on the hand, but instead sitting off to the side looking at the arm. I'm moving the arm to a series of 36 points on a path (blue line), and near each point I'm taking a position (xyz) and orientation (angle axis with theta magnitude) of Camera->Fiducial and Base->EndEffector, and putting them in the vectors required by the HandEyeCalibration Algorithm. I also make sure to vary the orientation by about +-30 degrees or so in roll pitch yaw. I then run estimateHandEyeScrew, and I get the following results, and as you can see the position is off by an order of magnitude. Ceres Solver Report: Iterations: 140, Initial cost: 2.128370e+03, Final cost: 6.715033e+00, Termination: FUNCTION_TOLERANCE. Am I perhaps using it in the wrong way? Is there any advice you can give? 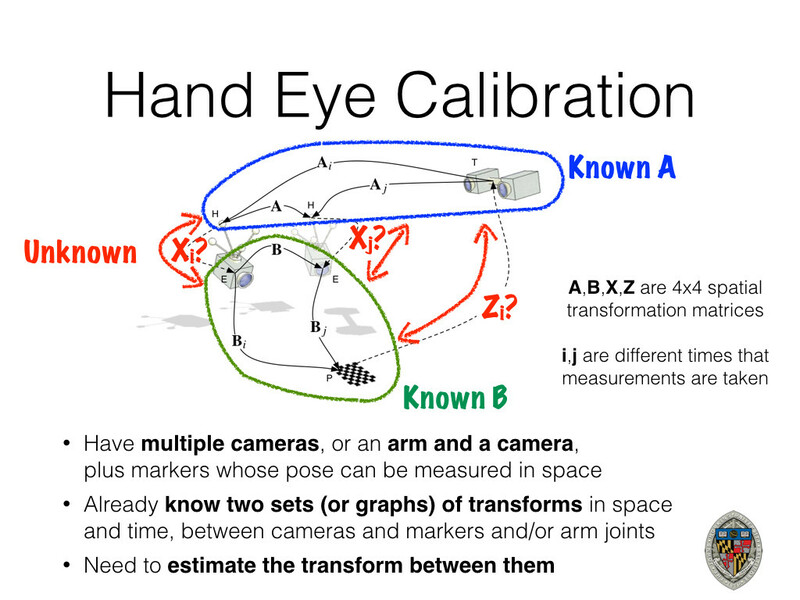 After solving the problem, I created a keynote presentation explaining many details about hand eye calibration for those that are interested. Practical code and instructions to calibrate your robot can be found at handeye-calib-camodocal. I've directly reproduced some key aspects answering the question here. Camodocal is the library I'm using to solve the problem. It is a well written C++ library that includes hand eye calibration, though documentation is extremely sparse. 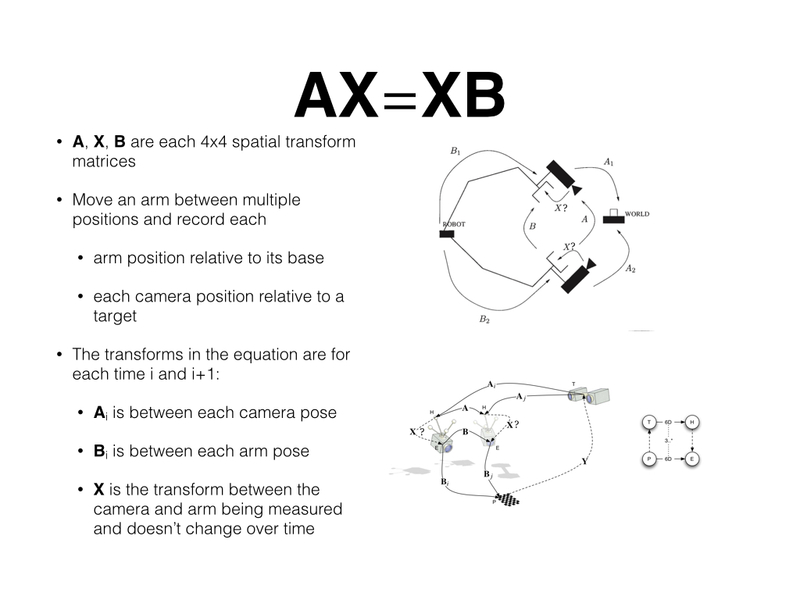 CamOdoCal: Automatic Intrinsic and Extrinsic Calibration of a Rig with Multiple Generic Cameras and Odometry, In Proc. IEEE/RSJ International Conference on Intelligent Robots and Systems (IROS), 2013. Lionel Heng, Mathias Bürki, Gim Hee Lee, Paul Furgale, Roland Siegwart, and Marc Pollefeys, Infrastructure-Based Calibration of a Multi-Camera Rig, Submitted to IEEE International Conference on Robotics and Automation, 2014. There is a package that implements a solver for this using camodocal + ROS called handeye_calib_camodocal. It also includes detailed troubleshooting instructions. Strobl, K., & Hirzinger, G. (2006) . Optimal hand-eye calibration. In 2006 IEEE/RSJ international conference on intelligent robots and systems (pp. 4647–4653), October 2006. 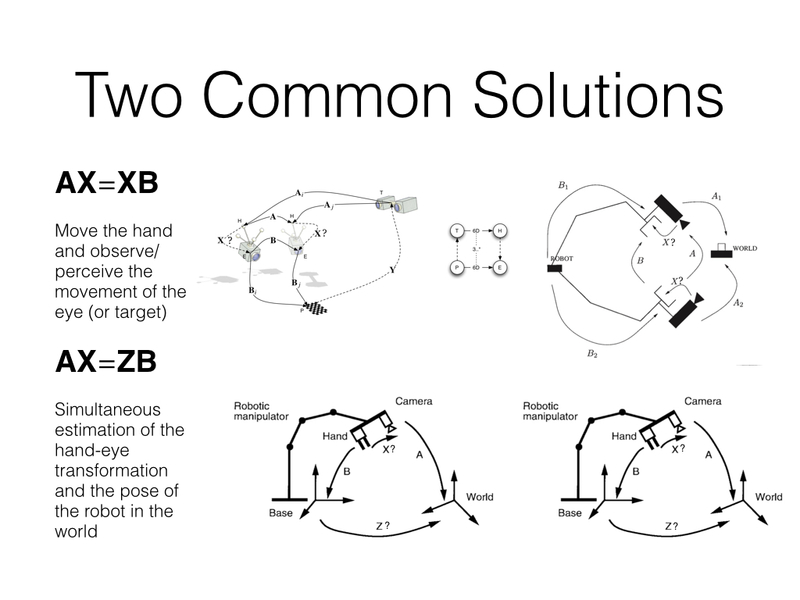 K. Daniilidis, “Hand–Eye Calibration Using Dual Quaternions,” Int. Journal of Robs. Research, vol. 18, no. 3, pp. 286–298, June 1999. 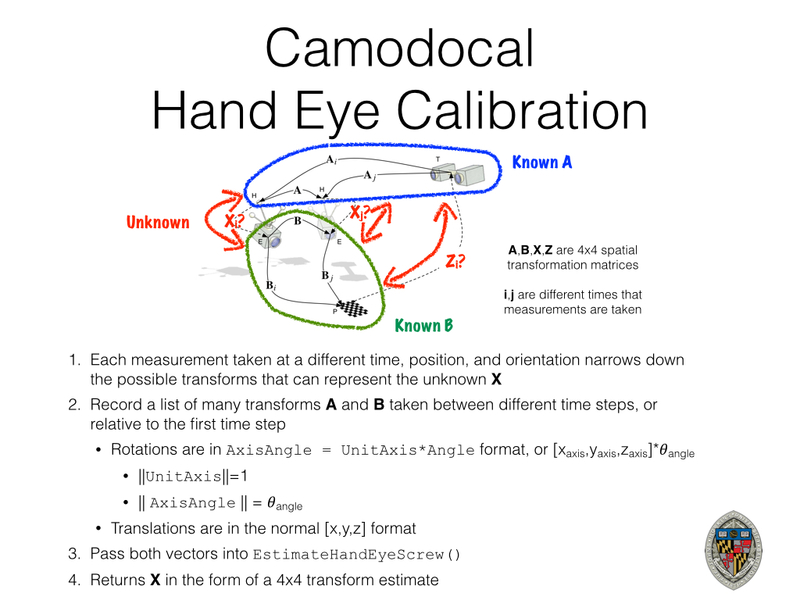 E. Bayro–Corrochano, K. Daniilidis, and G. Sommer, “Motor–Algebra for 3D Kinematics: The Case of Hand–Eye Calibration,” Journal for Mathem. Imaging and Vision, vol. 13, no. 2, pp. 79–100, Oct. 2000. 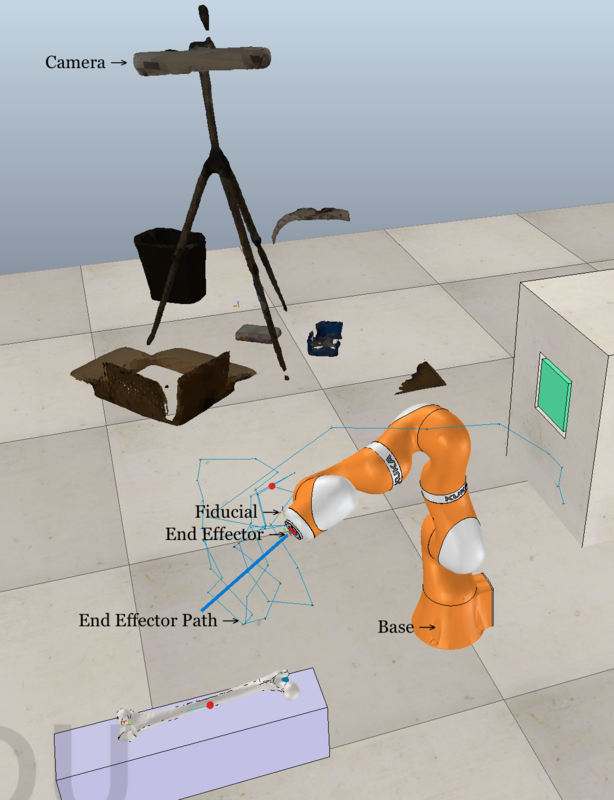 F. Dornaika and R. Horaud, “Simultaneous Robot–World and Hand– Eye Calibration,” IEEE Trans. on Robs. and Aut., vol. 14, no. 4, pp. 617–622, August 1998. Note: figures and text are from mixed sources including the presentation author, the various papers referenced, and the TUM wiki. The library you are using (and papers it is based on) seem to be for a different use case than what you are doing. They have a camera rig moving around a world with fiducials pulled out of a SLAM map, whereas you have a static camera and a moving arm holding fiducials. Fundamentally, yes they are the same, but i wonder if you used a different library that is more suited to a robot arm, if you would have better results. 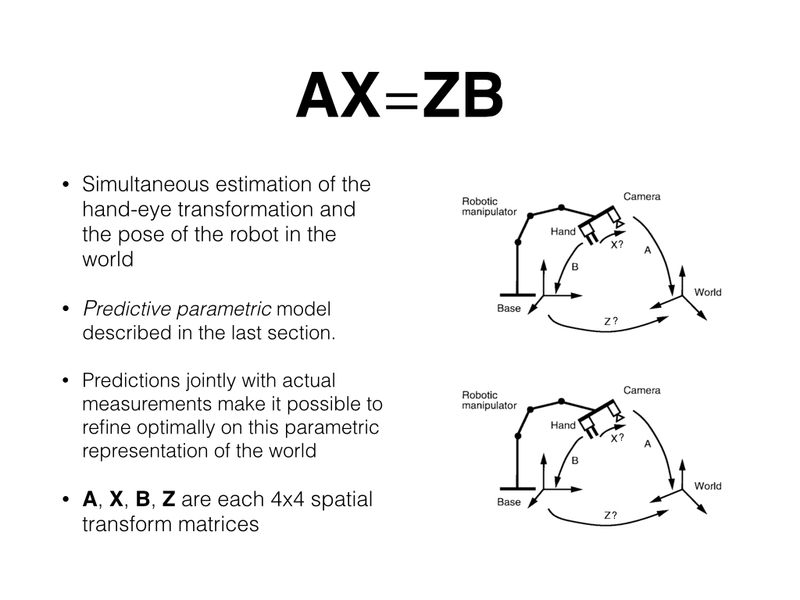 This is a paper you might consider: Calibrating a multi-arm multi-sensor robot: A Bundle Adjustment Approach. I don't know if there is source code. But it is ROS, so odds are good. Not the answer you're looking for? Browse other questions tagged robotic-arm stereo-vision calibration or ask your own question.